For over 70 years, Calhoun Community College has served the community, providing educational and training opportunities across north Alabama. 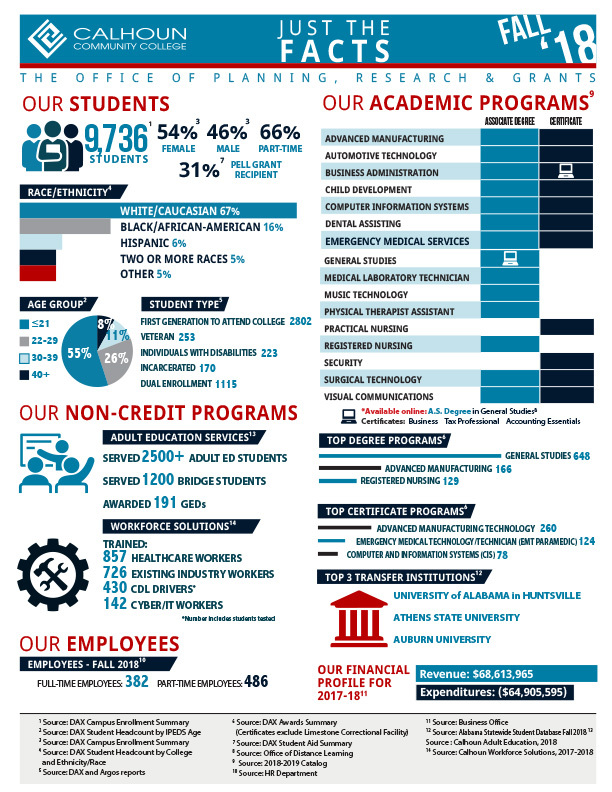 With approximately 10,000 credit students, Calhoun remains Alabama’s largest two-year college and the 6th largest higher education institution (two-year & four-year) in the state (behind the University of Alabama, Auburn University, the University of Alabama – Birmingham, Troy State, & the University of South Alabama). Calhoun has been recognized as one of the nation’s “Top 150 Community Colleges” by the Aspen Institute. Calhoun’s Huntsville/Cummings Research Park campus is the only two-year college campus in the nation located in a major research park. Calhoun is a member of the Achieving the Dream National Reform Network, which provides resources, support and evidence-based strategies focused on closing achievement gaps and increasing student retention, persistence and completion rates. The College is proud of its quality programs. Currently, 11 degree programs are nationally accredited. ACHE (Alabama Commission on Higher Education) Fall 2016 data indicates that Calhoun remains the “college of choice” for students from this region. Of the students from this area who attend public college, 29% of those from Madison County, 45% of those from Limestone County, 42% of those from Morgan County and 31% of those from Lawrence County chose to attend Calhoun . Funded through a $3.47M U.S. Department of Labor grant, the Alabama Center for Excellence in Clean Energy Technology houses the College’s Renewable Energy associate’s degree program, the state’s first and only such program. The building is the state’s first Platinum-level LEED certified facility under the new system. With over 1,000 students enrolled, Calhoun’s Dual Enrollment program continues to grow by offering high school students a “jump start” on their college careers.